Karen Russell’s comedic genius and mesmerizing talent for creating outlandish predicaments that uncannily mirror our inner in lives is on full display in these eight exuberant, arrestingly vivid, unforgettable stories. In“Bog Girl”, a revelatory story about first love, a young man falls in love with a two thousand year old girl that he’s extracted from a mass of peat in a Northern European bog. In “The Prospectors,” two opportunistic young women fleeing the depression strike out for new territory, and find themselves fighting for their lives. In the brilliant, hilarious title story, a new mother desperate to ensure her infant’s safety strikes a diabolical deal, agreeing to breastfeed the devil in exchange for his protection. The landscape in which these stories unfold is a feral, slippery, purgatorial space, bracketed by the void—yet within it Russell captures the exquisite beauty and tenderness of ordinary life. Orange World is a miracle of storytelling from a true modern master. KAREN RUSSELL won the 2012 and the 2018 National Magazine Award for fiction, and her first novel, Swamplandia! (2011), was a finalist for the Pulitzer Prize. She has received a MacArthur Fellowship and a Guggenheim Fellowship, the "5 under 35" prize from the National Book Foundation, the NYPL Young Lions Award, the Bard Fiction Prize, and is a former fellow of the Cullman Center and the American Academy in Berlin. She currently holds the Endowed Chair at Texas State University's MFA program, and lives in Portland, Oregon with her husband and son. "A feast of invention and a fun house of surprising wisdom, Orange World contains a ghost-ship lodge, tourist trade in a post-apocalyptic drowned city, a tornado farm, a local succubus. Karen Russell moves from the farcical to the forbidden with tender conviction. Don't miss this book of marvels!" "[A] brilliantly inventive... wonderful new collection of short stories...Russell grounds each story in human experience, both poignant and hilarious in turn... Underlying all of this is the exquisite beauty of Russell’s sentences, which will repeatedly surprise readers with their imagery and masterful language." "Eight crisp stories that will leave longtime fans hungry for more. 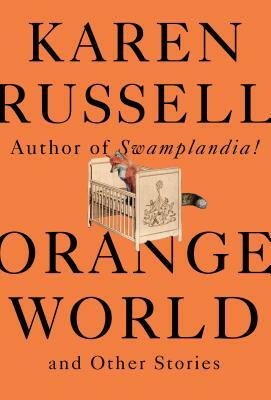 Since her debut more than a decade ago, Russell has exhibited a commitment to turning recognizable worlds on their heads in prose so rich that sentences almost burst at the seams. Her third collection is no exception, and its subjects—forgotten pockets of violent American history, climate-related apocalypse, the trials of motherhood—feel fresh and urgent in her care...A momentous feat of storytelling in an already illustrious career." "Virtuoso Russell, gifted with acute insights, compassion, and a daring, free-diving imagination, explores the bewitching and bewildering dynamic between "the voracious appetite of nature and its yawning indifference" and humankind's relentless profligacy and obliviousness." "Amidst the leading pack of talents Karen Russell writes the most like she’s on fire, as in: this close to revelations. Orange World is her best collection yet. Her imagination’s baroque syntax has been planed down to the absolute essentials, allowing the power of her vision to speak for itself...This is prophetic work written with clarifying fury."